Chocolate Brown (RAL 8017) 32mm Snap Frame available in both bespoke and standard sizes at cheap prices and quick delivery to the UK and London. This wall mounted poster frame is a lovely deep chocolate brown colour and looks just beautiful. 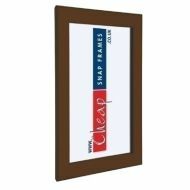 Ideal for places with a more traditional feel, or for bars and restaurants where you'd like to keep a moody look, but still have all the practicality of a snap frame. The edges of the frame snap open and shut from the front, so it is really easy and quick to change your posters. 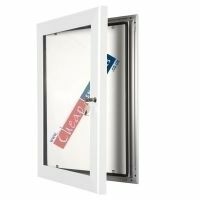 Available from only £17.80 + VAT and delivery. Delivery to the UK mainland and London is only £10 + VAT.